Virginia Cider Week is November 9-18, and Virginia cideries will be featured at tasting events across the Commonwealth. 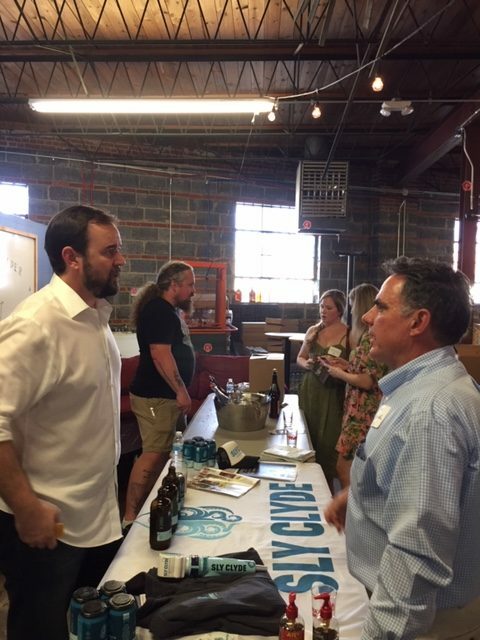 Kevin Clay of Big Spoon Communications organized the second annual Virginia Cider media and trade tasting today (10/2) hosted by Buskey Cider in Richmond’s trendy warehouse district (Scott’s Addition) where several local cideries are located. Despite the heat, attendees enjoyed a wide stylistic range of ciders from nine Virginia cideries; Albemarle Ciderworks, Blue Bee Cider, Bryant’s Cider, Buskey Cider, Castle Hill Cider, Courthouse Creek Cider, Old Hill Cider, Potter’s Craft Cider, and Sly Clyde Cider. Doug Smith (left, foreground) of Sly Clyde’s Cider and Andy Hannas (background, left) of Potter’s Craft Cider discuss their ciders with attendees. Potter’s Craft Cider Farmhouse Dry: A blend of five traditional cider apples, with no residual sugar. Bright, citrus/apple flavors, very dry, lean mid-palate, long finish, refreshing and a classic dry style. Blue Bee Charred Ordinary: described as a “traditional tavern-style ale” that would accompany salty colonial English-style foods. Nose: lovely delicate fresh apple, like a pie. Palate: dry, bold, great for salty foods like ham and cheese and fries. Old Hill Betwixt: nice aromatics of spicy apple. Palate: lively, nice spicy fruit, slightly sweet but full-bodied, flavors of fresh apple, a touch of tannin on the finish. Castle Hill Celestial 2016: a vintage cider, tart, zesty, light and racy, fresh, off-dry but refreshing and lively. Castle Hill Serendipity: the only cider to win a gold medal in the 2018 Governor’s Cup competition. Fresh, lots of apple flavors, rich and round, slightly sweet but well-balanced. Sly Clyde Submersive: Nose is fresh and clean like Prosecco. Palate: full-bodied, a plush texture like fine German spaetlese, but still fresh and well-balanced. Blue Bee Aragon 1904: Lovely fresh apple and cinnamon aromas (all apple-derived, no spice additions). Palate: rich, spicy and plump texture, juicy and stylish! Buskey Cider Earl Grey Lemon Ginger: The name might sound scary but Buskey is careful with keeping the fresh apple flavors and crisp acidity forward on the palate, with the flavorings delicately in the background. This has zesty tea and ginger notes but is gentle and cider-dominated on the palate. Buskey Tart Cherry: Natural pink color from the cherries (added post-fermentation); lovely pure cherry nose. Palate: bright, lively cherry and apple flavors with complementary acidity, fun and fresh, great for cooler weather remembering summer. Potter’s Craft Cider Nouveau: This cider was fermented with the skins of petit verdot and merlot pommace from King Family Vineyards. In a crummy grape vintage, this gave cider maker Andy Hannas just what he was looking for: a rose version of apple cider. Fresh pink color, with nice bright cherry and strawberry nuances and a salty finish from the grape pommace, married well with bright apple flavors and a crisp finish. Great apple version of a craft Virginia rose, perfect for summer. Sly Clyde Surf Hopper (dry hopped). Very subtle hops and dry cider, seems like a sauvignon blanc. Palate: full-bodied, smooth, fresh and cider-driven. Stylish. Sly Clyde Ginger Lemon: Nose is delicate with fresh lemon/ginger hints. Palate: smooth, very good integration of all flavors with crisp base cider, a great choice for Asian cuisine or as a fresh, low alcohol alternative to G&T. Courthouse Creek Blackberry Lavender: Made from all natural ingredients incl. hand-harvested lavender. Nose and palate: rich and full with lavender-dominant aromas and flavors, blackberry notes on the finish. Bottle conditioned for added complexity, a slight bitterness on the finish. Could enjoy with spicy Asian or Mexican food. Bryant’s Small Batch Hell Hop: All Bryant ciders are small batch and bottle-conditioned for texture and flavor complexity. On the nose, real full hops and cider aromas. Palate: great balance, slightly bitter but mostly cider flavors on the finish. Skillfully done (won a bronze medal in the Drink Outside the Grape competition, which I run). Bryant’s Small Batch Ol’ Lady This ginger-spiced cider was also aged in a bourbon barrel. It tastes strong and pungent, spicy like lemongrass and also like Chai from the ginger. Not subtle but fascinating, especially on a cold winter day, good for enjoying with spicy Asian or Indian food. For more information on the many cider tastings happening the week of Nov. 9-18, visit www.ciderweekva.com, #ciderweekva. Richard, thanks so much for your kind words and for highlighting Virginia cider. I believe that Bold Rock also received a Governor’s Cup gold for one of their Crimson Ridge series ciders in 2018.